Biting The Hand That Feeds You: FunBites Butterfly Picnic! *The Yucky Tree is some monstrous needle tree (coniferous?) in our front yard that has monstrous branches that grow like weeds down to bonk me in the head and mess up my hair, dumps loads of pollen onto my car every Spring, pelts us with pinecones as we traverse across the porch and into my car, and sheds needles like nobody's business all year round. I hate it. I'm constantly slipping on needles on the front porch, or finding those little pollen-making crunchy things in my hair (or food!) or having a panic attack when a pinecone falls and makes a noise like an intruder sneaking up behind me. But it gives us tons of privacy at the front of our house. And the cost to have it removed would put a dent in my BentoUSA gear fund... College fund. I mean college fund! 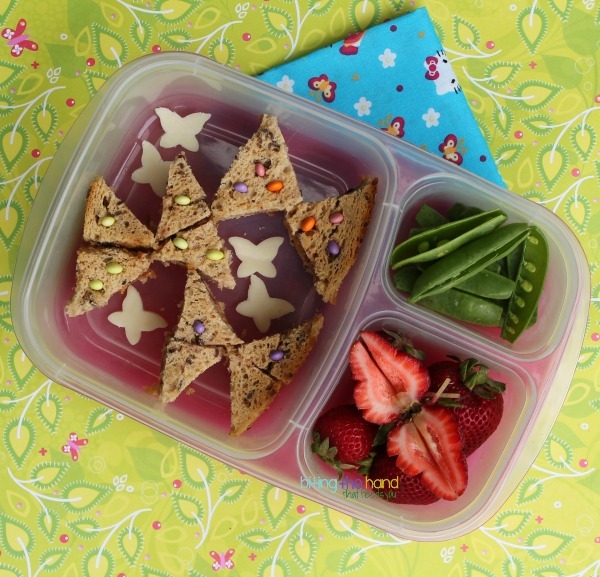 I used a mini butterfly cutter on some cheese to make a few fun shapes, and looked online to see how to make a butterfly out of a strawberry. I did it right, but I guess my strawberry shape was too long or something. Oh well. Stuck in some bits of uncooked (gluten-free) spaghetti noodle as antennae. I bough the cloth napkin from Red Poppy Crafts on etsy. 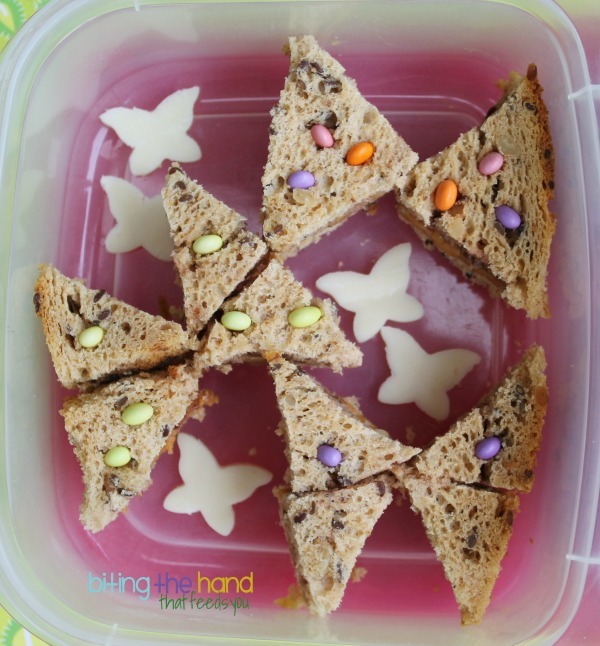 For the butterfly sandwiches, I cut up a PBJ with our FunBites Triangles cutter. For the Cube It, normally I cut the bread first, then spread the fillings on each tiny slice, which is annoying, but then I don't have to wash the cutter. I'm so lazy I actually make MORE work for myself! Ha! But the triangles have so many skinny little corners that are harder to spread onto, so I cut the whole sandwich. *Tip: To prevent the top slice of bread from splitting or bursting open, and your fillings from oozing out all over, and to get nicer cleaner edges (except with gluten-free bread. It's horrid to work with!) 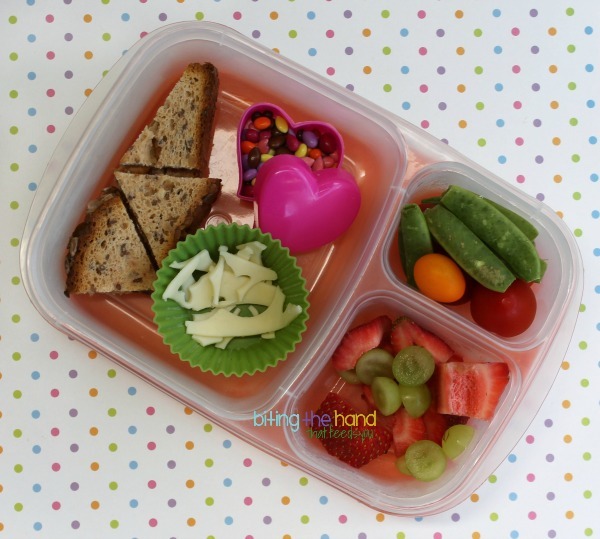 use this sandwich cutter method from Candy Girl at BentOnBetterLunches! This works great with any cutter you're using! Baby E got the scraps from Big Sister's lunch, plus some extra sunflower seeds, apparently to share with her sister, and some grapes and baby tomatoes, neither of which was something Zoe willing to eat at that time. Z set up some of the chocolate covered sunflower seeds in a nearby leaf to entice the squirrel back down (her little sister's, naturally. Not her own!) No luck though. That darned squirrel remained elusive. 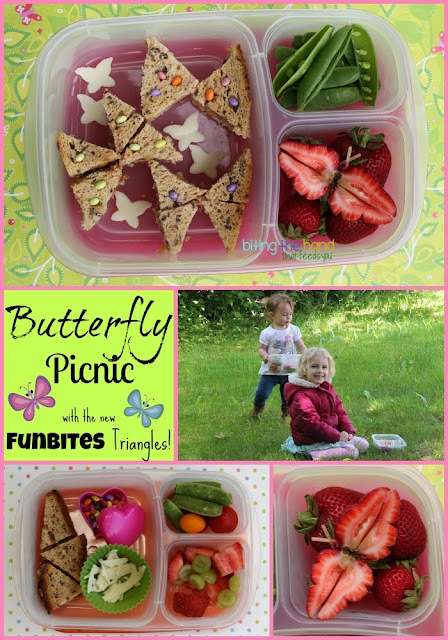 But the girls got along smashingly well, and enjoyed picnicking together. And no one got snatched or hit by a car. Woo! The strawberry butterflies are spectacular!!! Such a sweet post! !